Like the idea of zero, gunpowder developed gradually over time. 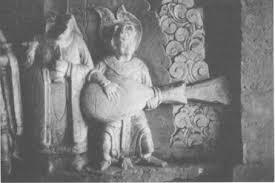 In 142 AD, during the Han Dynasty, a man named Wei Boyang was the first to write anything about gunpowder. He wrote about a mixture of three powders that would “fly and dance” violently. We aren’t sure that he meant gunpowder, but that’s the only explosive that uses three ingredients that we know of. He may have been a Taoist trying to find a potion to let you live forever. By 300 AD, a Jin dynasty scientist named Ge Hong had certainly written down the ingredients of gunpowder and described the explosion. Scientists made gunpowder in ancient China by mixing sulfur, charcoal, and saltpeter, or potassium nitrate. It probably wasn’t hard to think of mixing these three things. All three components of gunpowder were common in ancient China. Probably chemists were just mixing together a lot of things they had handy, to see what they would do. 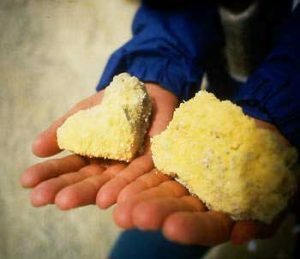 Sulphur: You got sulphur by mining it out of the ground, where it exists naturally as a yellowish rock. 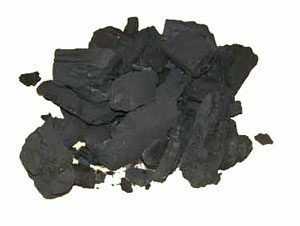 Charcoal: You got charcoal by burning wood very slowly, so that it blackened into carbon without burning completely. 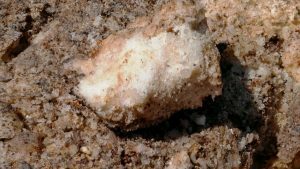 Saltpeter: You could make potassium nitrate, or saltpeter, by taking animal manure and letting it sit around for a while and decay. Then potassium nitrate crystals formed in the manure, and you could drain them off by washing water through the manure pile. Saltpeter also occurs naturally inside some caves, and you can just go to those caves and mine saltpeter there. You made gunpowder by mixing the three powders together, using about fifteen parts of saltpeter to three parts of charcoal and two parts of sulphur. The reason gunpowder explodes is that this mixture burns very fast. When it burns, it releases gases that are bigger in volume than the original powder (just the way steam is bigger than water is). But even though scientists like Ge Hong knew how to make gunpowder, and they knew that it would explode, they didn’t have any particular use for gunpowder. For hundreds of years, nobody did use gunpowder much. 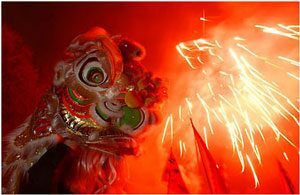 Slowly people in China started to use gunpowder as fireworks, to make an exciting evening at a big party or for a religious festival. Need a Halloween costume? Go as a Chinese lady! Or click here for lots more costume ideas! 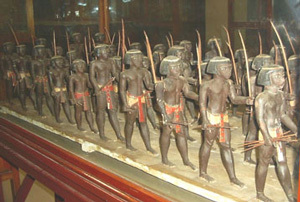 Under the rule of the T’ang Dynasty, about 700 AD, people used gunpowder more. T’ang Dynasty emperors used gunpowder to put on great fireworks displays. Two hundred years later, in 904 AD, Chinese inventors saw that you could also use gunpowder as a weapon. First the army used fire arrows and fire spears. That’s basically like attaching a firecracker to the end of a spear or an arrow, so it will burn people. What was the first army to use gunpowder? The first (possible) recorded use of gunpowder in an actual battle was in the last days of China’s T’ang Dynasty, in 904 AD. That’s when the Southern Wu’s ruler, Prince Yang Xingmi, may have used fire arrows against Du Hong in the siege of Wuchang, in southern China. 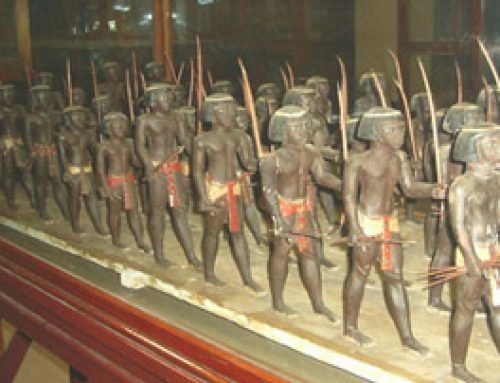 Soon after the use of fire spears, Chinese armies made the next big step. They used gunpowder in the form of rockets. They put small stone cannonballs inside bamboo tubes and shot the cannonballs out by lighting gunpowder at one end. This is the same idea that makes guns and cannons work today. Nobody knows exactly who was the first to use cannons in war. 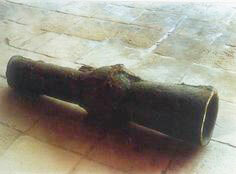 The first picture of a cannon is from 1128 AD, under the Song Dynasty. Cannons may have existed for a while before that. The first battle where we know someone used cannons was in 1287, when Yuan Dynasty (Mongol) generals used them to end the Mongol Nayan’s rebellion. The Mongol army also used gunpowder bombs when it was trying to invade Japan in 1281 AD. Soon after that, scientists in Japan started to experiment with gunpowder weapons too. By this time, Chinese engineers probably also used gunpowder to blast rocks away to make roads and canals. They seem to have used gunpowder in underground mines, to break the rock loose so miners could go in and gather up the loose pieces. Probably they also used gunpowder in stone quarries, to break loose pieces of stone. 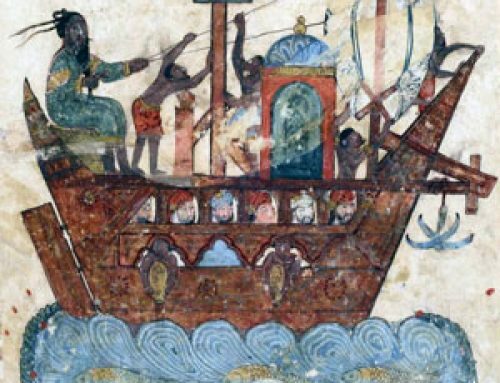 The Chinese emperors tried to keep gunpowder as a secret weapon, but by the 1100s AD their secret had gotten out, and people in the Islamic Empire and then the Roman Empire started to understand how to use gunpowder for weapons. After that, it wasn’t long before people in Europe also learned how to use gunpowder. 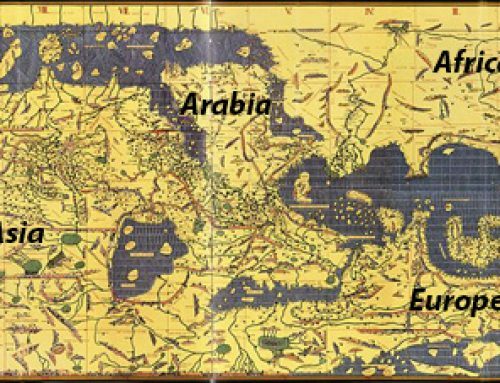 Nobody is sure exactly how they found out, but it might have something to do with the Third Crusade. 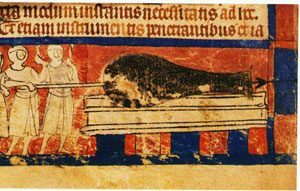 History of gunpowder: Earliest image of a European gun (1326). The gun shoots arrows. By 1216 AD, a monk named Roger Bacon in England described gunpowder as a weapon. He thought of it as something that came from foreign places. By the 1300s, Europeans were starting to use cannons regularly in wars. Cannons played a big part in the Hundred Years’ War between England and France. About the same time, Europeans also started to use gunpowder for blasting roads, and in mines, just the same way that people did in China. Unfortunately for the people of West Africa, they hadn’t heard about gunpowder yet when European people attacked them in the 1400s AD, which is one reason why the Europeans were able to defeat them. Since that time, guns have killed a lot of people. Quatr.us does not in any way support the use of guns for any purpose. Fireworks are very pretty, though! Did you find out what you wanted to know about the history of gunpowder? Let us know in the comments. See also Joseph Needham, Science and Civilization in China, 5-7 (Cambridge University Press, 1987). Cite this page: Carr, K.E. 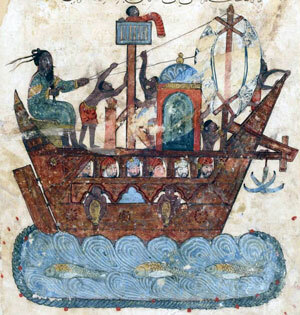 History of Gunpowder: Gunpowder in ancient China. Quatr.us Study Guides, June 7, 2017. Web. April 25, 2019.
hi Prof..your information help me a lots on understanding the existence of gun powder..is it the gun powder also known as black powder? Yes, early gunpowder is also called “black powder” to distinguish it from modern, smokeless gunpowder that is made a little bit differently. Hey I was wondering if maybe you could post your sources on this. I am a UCLA student writing a final paper on gunpowder, it would be really helpful. Thanks! Whoops just noticed the bibliography! Disregard! Oh, I’m glad that worked out for you! Best of luck with your paper. What would you like to know? I’ll be happy to answer if I can.